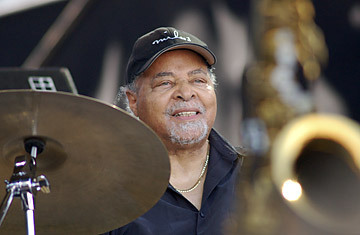 Drummer Jimmy Cobb performing at the JVC Jazz Festival in Newport, Rhode Island. Over two spring days in 1959, trumpeter Miles Davis convened five other musicians at a Manhattan studio for a new recording project. Released 50 years ago this week, the resulting album  Kind of Blue  became one of the best-selling and most influential jazz recordings of all time. Drummer Jimmy Cobb is the last surviving performer from the celebrated album, which also featured jazz legends John Coltrane, Julian "Cannonball" Adderley and Bill Evans. Now 80, Cobb continues recording and is currently touring the world through January with his band to mark the anniversary. He spoke with TIME about Kind of Blue's enduring impact and his decades of performing among the greats. When you all gathered for those sessions on East 30th Street, did you have any idea you were creating such an influential recording? Nobody that day knew it would have this longevity. For us, it was just another Miles Davis date. Miles Davis made a lot of pretty good record dates, and we just figured this was another good one. I don't know. It's just a music whose time had come, I guess, and a lot of people were ready to listen. It was a pretty good hit as soon as it got out  everyone was playing it, I was hearing it on jukeboxes and things. It must have been pretty good. That particular day I didn't have any instructions or anything  [Miles] would just tell me what the cadence and time signatures were and things like that. He may have had some rehearsal with the horn players, but that day he just came in with some manuscript paper and they went right to it. In my teens, I used to listen to Billy Eckstine's band. He had all the great players  Charlie Parker, Dizzy Gillespie, anyone you can mention probably went through that band. The drummer was Art Blakey. When I was still at home and 18 years old, I had the opportunity to play with Billie Holiday. She had a pianist who was going to college in Washington, and he formed a little quartet when she came to town. Yes, that and a friend of mine who lived in the neighborhood. He used to come to my house; I had a few jazz records we would play and drum on the table with our knuckles. You've played with many of the biggest names in jazz history. It must be hard to choose, but does anyone particularly stand out in your memory? Dinah Washington and Sarah Vaughan  I have to mention them. They gave me a certain feeling I hadn't had, being raised in the Catholic church. Dinah Washington  she was a totally different thing that I wasn't used to hearing. And Sarah Vaughan, I used to get goosebumps every night playing with her. There's a lot of good players. Schools are pumping them out faster than I think they can get jobs, but they seem to be very interested in the music. If they have a love for it, I think we can keep it going. Over the years there's been a surge in girl drummers  killer drummers who are really entertaining. The first one I was really associated with was Terri Lynn Carrington, I knew her when she was a little girl. You've made it to 80 years old in a business where many don't make it nearly as far. A lot of musicians fall into drugs and make all kinds of bad choices. I imagine you're at the point where you didn't have to keep working if you didn't want to. What's driving you to stay on the road and keep at it? I like to do it, and I'm really not at the point that you say I am. Being on a record like [Kind of Blue], you may think I was getting a lot of that money, which is not true. You can throw that one out. I'm just out there like a working man.